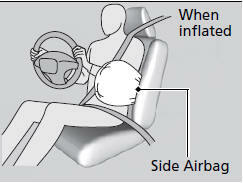 The side airbags help protect the upper torso of the driver or a front passenger during a moderate-to-severe side impact. If the impact is on the passenger side, the airbag deploys even if there is no passenger in the passenger seat. 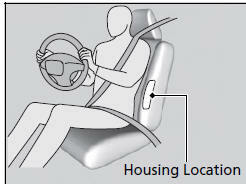 The side airbags are housed in the outside edge of the driver’s and passenger’s seatbacks. Because the airbag systems senses sudden acceleration, a strong impact to the side of the vehicle’s framework can cause a side airbag to deploy. In such cases, there may be little or no damage, but the side impact sensors detected a severe enough impact to deploy the airbag. It is possible for a side airbag to not deploy during an impact that results in apparently severe damage. This can occur when the point of impact was towards the far front or rear of the vehicle, or when the vehicle’s crushable body parts absorbed most of the crash energy. In either case, the side airbag would not have been needed nor provided protection even if it had deployed. To reduce the likelihood that a front passenger may be injured by an inflating side airbag, the passenger side airbag is automatically turned off when: • The height sensors detect a child or short-statured adult is seated in the front passenger seat. 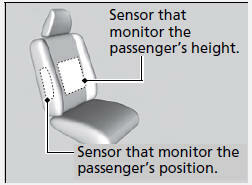 If the side airbag off indicator comes on, have the passenger sit upright. A few seconds after the passenger is sitting properly, the side airbag will automatically be turned on, and the indicator will go off. If the front passenger is a child, stop when it is safe to do so, and have the child sit properly restrained in a rear seat.